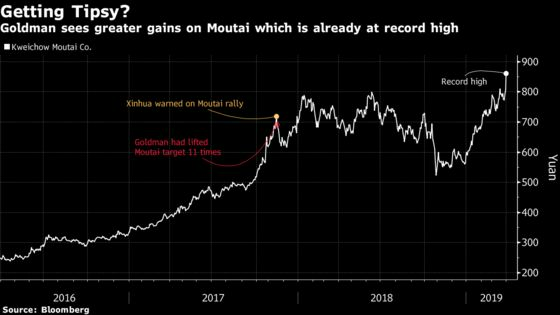 (Bloomberg) -- When Goldman Sachs Group Inc. analysts last got this excited over Kweichow Moutai Co.’s shares, the result was a reprimand from Beijing that ended with a $6 billion sell-off. This time round, Xufa Liao and Steven Ma are pinning their bull case on an expected increase in sales and prices of the costly liquor the company makes. They’ve hiked their price target for the stock by three times in less than two weeks and now project it to rise by 26 percent from Thursday’s close to 1,016 yuan a share in 12 months’ time. The latest catalyst was blockbuster earnings. The world’s most valuable liquor stock reported a 30 percent increase in 2018 net income to 35.2 billion yuan ($5.2 billion) amid rising demand for its products. Like last time, Goldman has momentum on its side. The shares have jumped 37 percent this year through Thursday, and added another 5.9 percent in Shanghai on Friday. Yet, risks to the rally are growing. The stock is trading at a record high level relative to the CSI 300 Index, while its 14-day relative strength index is above the 70 level that signals an asset may be overbought to some traders. Beijing has already shown a readiness to step in to cool gains in the market if things are looking overheated. After the last time they warned investors to calm their enthusiasm toward Moutai, the stock fell 14 percent in less than two weeks. Goldman did not immediately respond to Bloomberg’s request for comments.